New Delhi, May 16: The Supreme Court has refused to stop BJP leader BS Yeddyurappa’s swearing-in as Karnataka Chief Minister, but will hear the case again on Friday. The court has asked that the letter given by Yeddyurappa and senior BJP leaders to the Governor in which it was stated that the party has the requisite number of MLAs to form the government be produced before the court. The apex court made it clear that it won’t stay the swearing-in but it would be subject to outcome of the petition in the court on Friday. The Congress-JDS had moved the court late on Wednesday night, seeking a stay on the swearing-in, calling it unconstitutional. It argued that the Governor should have invited the majority post-poll coalition of JDS-Congress first. The 15-day window given to BJP to prove its majority was also deliberated upon, but the court refused to modify it, for now. *No stay on BS Yeddyurappa’s swearing-in today. However, it will be subject to outcome of case. 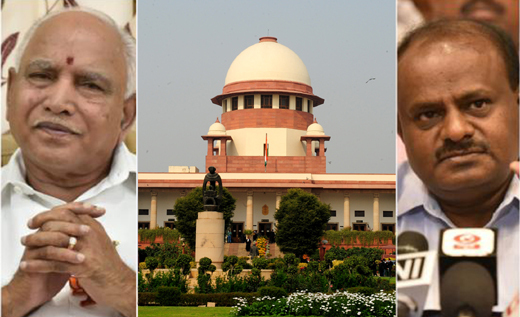 *Supreme Court says produce letter written by BS Yeddyurappa on May 15, May 16 to Governor by 2.00 pm today. *Court will hear matter again at 10.30 am on Friday. *Number of days to be given to Yeddyurappa to prove majority can be debated after two days: Mukul Rohatgi to SC.